The Chess Drum is beating in Vietnam as the nation of 90 million is experiencing a growth in the sport. Daaim Shabazz will be in Hanoi, Vietnam to visit with the chess community at the chess center on Nguyen Luong Bang street, Dong Da district, Hanoi. 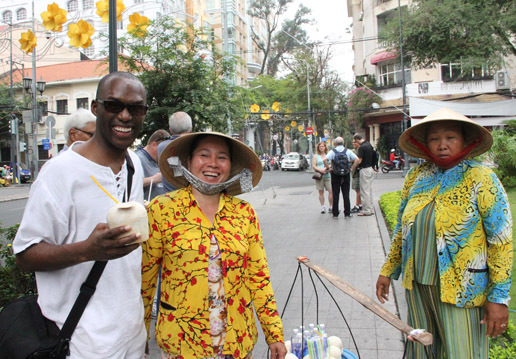 The Chess Drum’s Daaim Shabazz in Ho Chi Minh City, Vietnam. Vietnam is a land of hard-working, resourceful citizens who have been able to ride the wave of an Asian economic resurgence after the ill-fated Asian Crisis in 1997. Vietnam became independent from France in 1954 and then fought a bitter war against the U.S. known as the Vietnam War or American War… depending on whose perspective you take. Vietnamese chess has grown over the past and are lead by 22-year old Le Quang Liem who came out of obscurity to win two consecutive Aeroflot Opens and is the reigning World Blitz champion. With seven GMs including Nguyen Ngoc Truong Son and veteran Dao Thien Hai. After spending a week in Ho Chi Minh City, I will arrive in Hanoi and be received by the chess community there. I am traveling as part of a faculty development tour with 15 other professors from around the U.S.
Great trekking “Globetrotter”! Have fun! Know that you will represent! Good to see you around the world – nice picture! it was very nice to meet you in HNI , that is a wonderful day for Hanoi chess community . I hope to see you again in Viet Nam in near future . All the best for you !! !